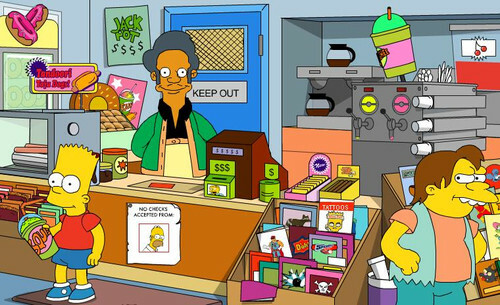 The Simpsons is one of the most entrepreneurial shows on television. Throughout its more than 500 episodes, the characters engage in, and interact with, dozens of small business ventures. Their hometown of Springfield is Anytown USA, where the citizens participate enthusiastically in the local economy — including establishments like Krusty Burger, Lard Lad Donuts, King Toot’s Music Store, Luigi’s, the Gilded Truffle, Red Blazer Realty, The Android’s Dungeon, the Kwik-E-Mart, and of course Moe’s Tavern. Homer works for the Nuclear Power Plant, but he’s one of TV’s most prolific side hustlers. He’s always got some new business idea or money-making scheme going on. He’s been a door-to-door sugar salesman, a baseball mascot, a food critic, a cartoon voice actor, a night manager at the Kwik-E-Mart convenience store, a grease re-seller, and even an astronaut. And while many of the businesses on The Simpsons do end up in failure, they leave behind a lesson plan more entertaining than any MBA program. Let’s study up! In The Call of the Simpsons (Season 1), Homer and the family visit Bob’s RV Round-Up to shop for an RV they can’t afford. Even though the banner at the dealership reads, “We’d rather make a friend than a profit,” Bob recognizes a sales opportunity when he sees one, offering up a “Thank you God” as his unsuspecting victims walk onto the lot. He goes on to explain all the luxury bells and whistles of the 2-story Ultimate Behemoth, and compliments Homer’s “god-like” features. Homer, trying to keep-up-with-the-Flanders’, is sold. Thankfully, Homer’s less than god-like credit score prevents him from making the far-too-expensive purchase — and instead they settle on a more budget-friendly option. The Lesson: In any sort of sales situation, do your own due diligence. The person you’re relying on for information may not have your best interest in mind. In Bart Gets an Elephant (Season 5), Bart wins an elephant from a radio contest and names him Stampy. 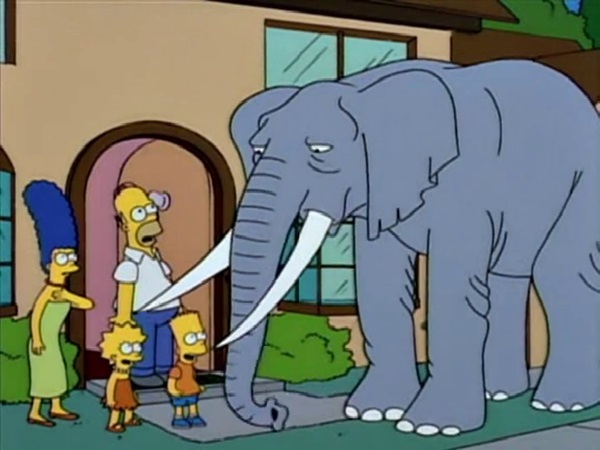 The family keeps the animal in the backyard, and Homer begins to sell elephant rides to the neighborhood kids for $2 apiece. Of course, Marge points out that Stampy ate $300 worth of food that day. The Lesson: Profit = Revenue – Expenses. Homer forgot the expenses portion, and that was the difference between a money-making venture and one doomed to fail. In New Kid on the Block (Season 4), Homer sees an ad for all-you-can-eat seafood at the Frying Dutchman restaurant. He and Marge hire a babysitter and head out for date night. The Lesson: Advertising messages are heavily regulated, so if you make a strong claim or guarantee, make sure you can back it up. It’s probably not worth the risks of upset customers and legal action to hype up marketing language to a point you can no longer deliver. In 22 Short Films About Springfield (Season 7), the Springfield police crew are enjoying lunch at the local Krusty Burger. Krusty Burger doesn’t fear the competition because they have a loyal (and very sheltered) customer base. The police crew discuss the differences between the two restaurants and conclude they’re happy with the familiar fare of Krusty Burger. Later, Krusty’s popular Ribwich sandwich draws a cult following that calls themselves Ribheads. The Lesson: If your business idea is any good at all, competition is inevitable. But successful businesses don’t sweat their competitors; instead they focus on what unique value they bring to the table. RibWich Commercial from ronno on Vimeo. In Bart’s Inner Child (Season 5), the family scores a free trampoline. The kids are thrilled, and Homer’s entrepreneurial sense starts tingling. He begins to charge their friends and neighbors for jumping time, and has visions of a larger backyard theme park. But the trampoline proves to be dangerous, as many customers wind up injured. Lacking the safety equipment and liability insurance to stay in business, Homer has to shut down the fledgling operation. The Lesson: Make sure you have adequate liability insurance and asset protection. Even if you’re not running a backyard trampoline business, you never know when someone in our super-litigious society will come after you. In Last Exit to Springfield (Season 4), the family discovers Lisa needs braces. However, Mr. Burns, in an attempt to cut costs at the power plant, has removed the dental plan benefits from the union contract — replacing it with a free keg of beer at the union meetings. Eventually, Homer realizes if they approve the contract, he’ll have to pay for Lisa’s braces out of pocket. He is enthusiastically elected the new union leader and begins a series of negotiations with Mr. Burns. Without an agreement, the power plant workers go on strike, and Mr. Burns eventually concedes to the union’s demands — and Lisa gets her braces. The Lesson: The technology or business trend du jour might look attractive, but if you don’t understand it, you’ll probably just spin your wheels. For instance, you’ll see websites with links to their twitter, instagram, and pinterest pages, but no activity on any of those platforms. There’s no rule that says you have to be involved in every “next big thing” — especially if it’s not relevant to your business. In Homer vs. the Eighteenth Amendment (Season 8), Springfield discovers a law on prohibition is still on the books. With alcohol now illegal, Moe disguises his tavern as a pet shop, and citizens turn to a bootleg supply from the mob. Anxious to get in on the action, Homer sources a load of discarded beer from the landfill. 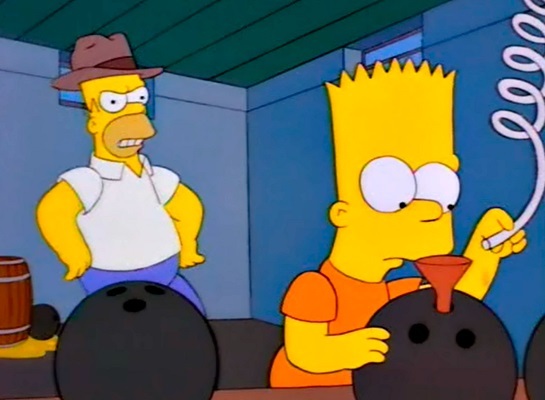 He pours the beer into hollowed-out bowling balls, and through an elaborate series of pipes, delivers the goods to Moe’s. Marge is impressed with his ingenuity and is happy with Homer’s new side hustle income as the town’s “Beer Baron.” However, Homer’s supply soon runs short, and he begins brewing his own liquor in the basement. While he manages to stay one step ahead of the law, the stills begin exploding and he eventually turns himself in. The fate of the business is sealed for good when a city hall official finds out the original prohibition law was actually repealed only a year later. The Lesson: Having a monopoly on an in-demand product is great, but dangerous when that product is illegal. Also, businesses that rely on a friendly regulatory environment are inherently risky. The government could essentially put you out of business at any time. In Season 4’s Mr. Plow, Homer buys a truck with a snow plow attachment, reasoning he can afford the payment with money earned from plowing driveways. Jealous of Homer’s success, his friend Barney starts a rival snow plow company, called Plow King, and records a commercial of his own. The relationship turns bitter as Barney wins market share and Homer retaliates with some dirty and dangerous tactics. Ultimately the two reconcile their differences, and a heat wave puts them both out of business. The Lesson: A memorable ad can mean the difference between making sales and making nothing. When it comes to customer service, no one in Springfield knows the value of a long-term client more than Apu Nahasapeemapetilon, the proprietor of the local Kwik-E-Mart convenience store. Even if the big-box grocery stores offer a larger selection and better prices, they can’t beat Apu’s convenience and friendly service. For a small town “mom and pop”-style operation, customer loyalty is earned with every transaction. The Lesson: It’s more costly to acquire a new customer than it is to sell more to an existing customer. In Season 7’s Bart Sells His Soul, Moe transforms his tavern into a family-friendly restaurant. Uncle Moe’s Family Feedbag enjoys some brief success, but the surly bartender isn’t cut out to be friendly and polite to this new demographic of customers. He eventually snaps at a little girl and decides the family restaurant business isn’t for him. Rather than continue to pretend to be something he’s not , he returns the bar to it’s previous state — and with the transition is visibly more relaxed and content. The Lesson: Not all business models will be a great fit for you, and that’s OK. Some people are natural-born salespeople, while others are better suited to different roles. Uncle Moe’s Family Feedbag from Bryan Maul on Vimeo. 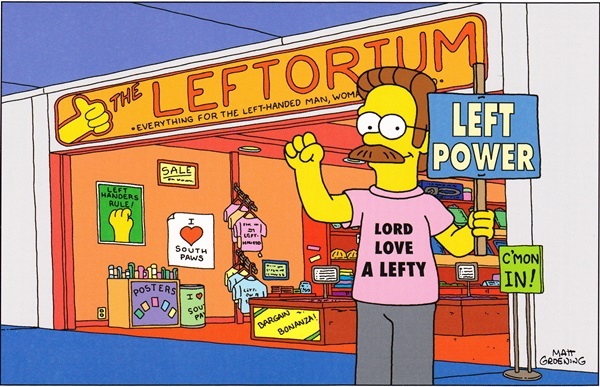 In Season 3, Ned Flanders opens The Leftorium, a store selling items specially built for left-handed people. The store falters, with most patrons stopping by simply to have their parking validated without purchase. As Flanders struggles to keep his business afloat, Homer comes across more and more lefties who would be perfect customers. Even though he initially wished his neighbor would fail, Homer eventually does the right thing and begins to refer people to The Leftorium. The word of mouth spreads through the small town and Ned’s business survives on the back of his personal network. The Lesson: Your network amplifies your reach and can connect you with the people who can help your business. In King-Size Homer (Season 7), the power plant implements a daily calisthenics program to help workers get healthier. Homer despises the new exercise routine and learns that employees with a disability can qualify to work from home. Then he discovers that workers who weigh over 300 pounds are considered disabled, and so embarks on a mission to purposely gain weight. “I just tripled my productivity!” Homer exclaims. Growing weary of punching the button himself, he finds a perpetual motion toy bird to be just as effective. Unfortunately the bird doesn’t have any reasoning skills or nuclear safety training and brings the power plant to the brink of meltdown. Homer attempts to call the plant to warn them, but his fingers are too fat to dial. To save the day, he rushes there himself and prevents the disaster. The Lesson: Before outsourcing any part of your work — mission-critical or not — make sure whoever you hire is up to the task. A poor hiring decision can be costly both in terms of time and money. In Season 6, The Simpsons pay a visit to Itchy and Scratchy Land, a theme park modeled around their favorite violent cartoon cat and mouse. The park is an homage to Disneyland, but the episode parodies Jurassic Park when the attractions start to attack. However, the theme park is a natural brand extension for the popular TV characters. It’s a chance to engage on a deeper level with their biggest fans. Itchy and Scratchy land is a destination, a place designed to create lasting positive family memories. The theme park gives the TV characters a chance to get off the screen and into real life — and into the hearts and wallets of the guests. Instead of just earning TV and licensing fees, now Itchy and Scratchy can earn parking fees, park admittance fees, souvenir sales, and food and beverage sales. The Lesson: Extend your brand and your business where it makes sense. In Oh Brother, Where Art Thou? (Season 2), Homer discovers he has a long-lost brother named Herbert Powell. Herb is the super-successful owner of Powell Motors, an automobile manufacturer in Detroit. Herb is enthralled to find out about his new family, and forms an immediate bond with Bart and Lisa. As a gesture of goodwill, he invites the family to visit him in Detroit, and calls on Homer to help design a new car. Initially Homer is timid with his design choices, but after a pep talk from Herb, really lets his creative spirit fly. 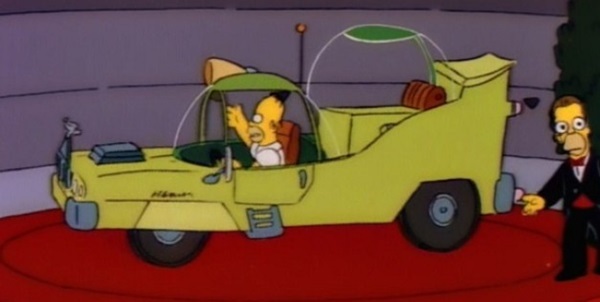 The end result is a car that is truly unique; it has a glass-domed roof, tail fins, and a horn that plays “La Cucaracha.” The car is unveiled to a shocked crowd and Herb soon realizes he gave Homer too much design freedom and offered too little oversight and guidance. To make matters worse, Homer’s car comes with a price tag of $82,000 which leaves Herb bankrupt and Powell Motors out of business. The Lesson: Getting outside design input was a great idea, but giving complete unchecked control over to anyone — especially an outsider — is a recipe for disaster. No one knows your business like you do. Comic Book Guy (Real name for trivia buffs: Jeff Albertson) is a recurring character on the show and the owner of The Android’s Dungeon comic shop. He’s a prime example of someone who eats, sleeps, and breathes his business. Comic Book Guy is obese and nerdy, but also wickedly smart; he’s got a 170 IQ and is member of Springfield’s Mensa branch. We learn in one episode he holds a master’s degree in folklore and mythology, and translated The Lord of the Rings into Klingon for his thesis. He runs the store as more than a business; it’s his life. Some comic book issues have too much sentimental value for him and he can’t part with them, even at the risk of insolvency. 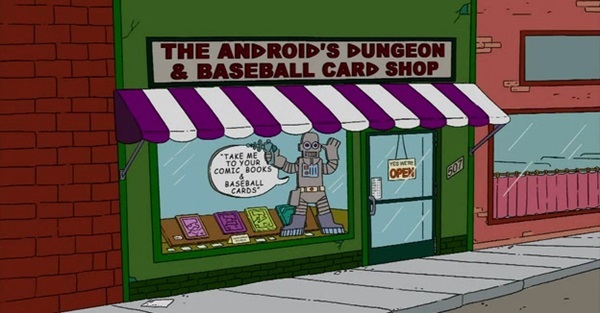 Still, his loyal customers like Bart and Milhouse know The Android’s Dungeon is their best bet for comic books, trading cards, and condescending sarcastic remarks. The Lesson: Do what you love, and you’ll never work a day in your life. Did I miss any of your favorites? Let me know in the comments below. With more than 500 episodes, I’m sure I missed some good ones! And if you liked this post, please share it! I don’t really like the Simpsons, but I prefer Family Guy over anything. Really interesting article comparing some of their traits to business characteristics. I do agree in being yourself and take your own story to create greatness. Thanks for the post and keep up the good work over here! One of my favorites is Homer’s patent pending “Miracle Spine-O-Cylinder”, a dented old trash can he used to straighten peoples spine out of his garage. A true Side Hustle…until Springfield’s Chiropractor gang sneaks in and destroys his invention. Haha yes that’s a great one! Simpsons ..hehe..I like it very much and am watching it from many years.So luck to come across your excellent blog. Your blog brings me a great deal of fun.. Good luck with the site. Thanks for sharing this. I grew up watching the Simpsons and forgot about many of these moments. I appreciate the reminder of these great events. A lesson anyone should learn and use entrepreneurship to their advantage is never rely on a traditional cushy day job. Narcissist employers only want to rob employees and keep their monies due to them. They’ll not only keep their money, but set them up for termination, talk bad about the person to other members in management, cast the person they’re out to get in a certain light before other employees and create enmity between the targeted person and the employees for the sake of covering up the narcissists’ skeletons in their closet. Those are valuable business lessons anyone can use to their entrepreneurial advantage in staying energetic about their side hustle and their ability to prosper as an aspiring entrepreneur striving to achieve greatness.